Eric and Robbie have conquered a year of podcast! They take a look at Moon Knight #3, Original Sin #1, and Futures End #1 in Weekly Floppies! They talk Game of Thrones and more roguelike games, and have a in depth discussion about the state of the comics industry as well as nerd culture in general in their first annual State of the Comics Union! Get it while it’s hot! 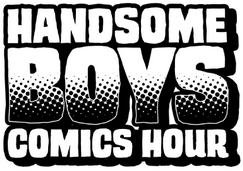 This entry was posted in Episodes and tagged a dance with dragons, andy daly's podcast pilot project, comics industry, detective comics, full mojo rampage, moon knight, nerd culture, the futures end, woods on May 12, 2014 by handsomeboyscomicshour. Hello Handsomites! Eric and Robbie are coming at you on the heels of three days at Megacon, Florida’s largest comic book convention! They talk about their experiences there, and also talk about the week’s newest books, including the spectacular Ms. Marvel #2! Great times, great stories, great podcast! Button up and tune in! This entry was posted in Episodes and tagged animal man, comic book convention, megacon, ms. marvel, new avengers, red hood and the outlaws, sovereign on March 24, 2014 by handsomeboyscomicshour.